The following continues a series of planned articles profiling notable, desirable, valuable, and/or unique space artifacts and memorabilia. Parker produced 254 pens to commemorate the 10th anniversary of the National Aeronautics and Space Administration (NASA) in 1968. The pens were made in part from the Atlas booster rocket which launched John Glenn on his historic 1962 orbital Mercury flight. The flown booster material used by Parker was recovered in Africa. After its discovery, it was sent to NASA, which subsequently verified its origin. Of the 254 produced, all but four were Parker Classic 75 models, sterling crosshatch grid ballpens with its push button clicker fashioned from the booster material. Never released for sale to the public, George Parker presented the ballpoint pens to heads of state and NASA officials. The remaining four were fountain pens. The entire cap and barrel material was made from flown metal. Parker kept two of the pens for its internal use while the others were presented to Glenn and President Johnson. This Pen is Made from a Fragment of the Rocket which Boosted Astronaut John Glenn into America's First Orbit Space Flight 20 February 1962. Of the two kept by Parker, one recently surfaced at a Chicago pen show and auction in 2000. There, the rare fountain pen sold for a hammer price of $3000. 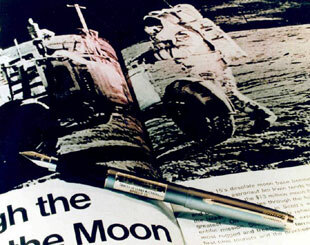 Subsequent to the auction, this pen and another produced by Parker with Apollo-recovered moon dust (see below) sold for approximately $20,000. 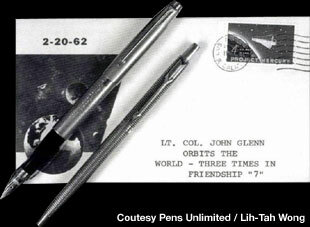 On February 23, 2001, this same set of space pens changed hands once more via a Bonhams auction. Including the buyer's premium of 15%, the Mercury fountain pen sold for over $22,500 alone. In 1972, Parker produced five fountain pens entirely from titanium with the exception of a special plate mounted to the barrel. To distinguish these pens from all others, moon dust collected by Apollo 15 astronauts David Scott and James Irwin was mixed with powdered gold to mint the attached panels. At first it was thought that only three of these pens were made and presented to the US State Department. President Nixon kept one and took the other two on his historic trip to China in 1972. The President presented the the two moon dust-embedded fountain pens to Yao Wen-yuan, Municipal Representative of the City of Shanghai, and Nan P'ing, the Chairman of Chekiang Provincial Revolutionary Committee. It was later learned that Parker secretly produced an additional two moon dust pens. One of these pens surfaced at a Chicago pen show and auction in 2000 and sold for $4500. 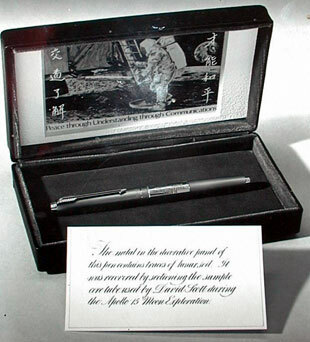 Subsequent to the auction, this pen and another produced by Parker with Mercury-Atlas 6 flown metal (see above) sold for approximately $20,000. On February 23, 2001, this same set of space pens changed hands once more via a Bonhams auction. Including the buyer's premium of 15%, the moon dust fountain pen sold for over $26,500 alone, likely the record for the single highest price ever paid for a Parker 75 fountain pen. For further information about Parker's Mercury-Atlas 6 and moon dust space pens, visit Parker75.com, the website of Lih-Tah Wong. © 2016 collectSPACE.com All rights reserved.